Leizhan offers various thickeners for improving the consistency and quality of recycled pulps. 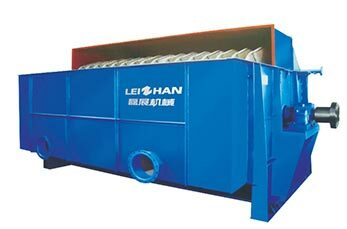 Leizhan ZDP Series Double Disc thickener and ZNX series inclined screw thickener are specially designed for washing and thickening the fiber pulp. The ZDP Series Double Disc thickener is thickening machine used to wash and thicken for low consistency slurry. Stainless steel filter screen ensures long service life of the machine. The concentration of input pulp is 2-5%. 1. Combined with disc type filter drum enlarges filter area. 2. Less space requirement, but large production capacity. 3. Filter screen adopts stainless steel material. 4. Compact structure for pulp washing and thickening. The performance of the inclined screw thickener is based on 34 years of pulping experience. The inclined screw thickener is cost efficiency, easy installation and operation pulping device for thickening paper pulp in a consistency range of 3.0-4.0%. The consistency of output pulp can reach 10.0-14.0%. 1. Suitable for all kinds of paper pulp. 4. Special brush design running with screw in synchronism.